Franklin High School Track & Field is hosting its second annual Wildcat Color Run on April 13th at 10:00am at Franklin Community Park. The event aims to engage the community in an initiative that encourages a healthy way of living. It is open to everyone in the community (including little ones) and we encourage you to sign-up with your friends! 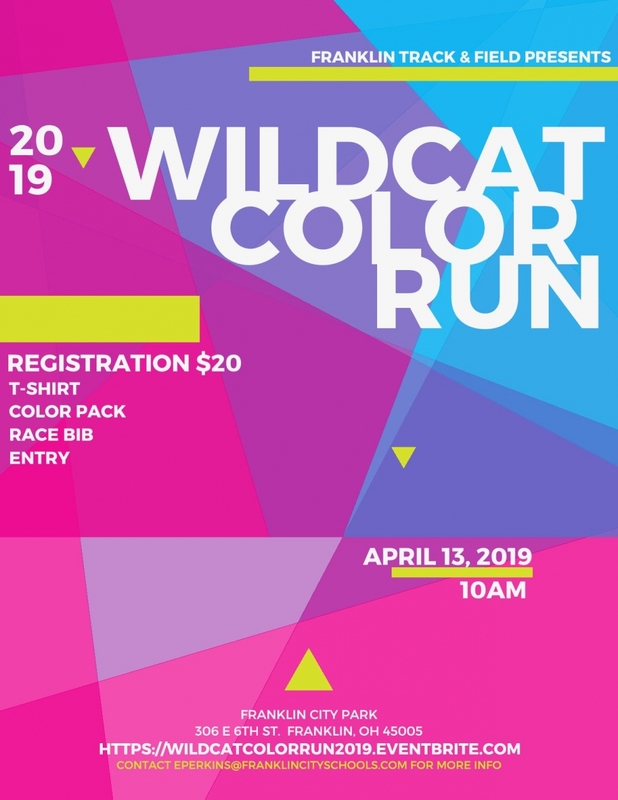 Online registration is available at https://wildcatcolorrun2019.eventbrite.com and paper registration forms are also available. registration closes March 20. If you are interested in volunteering to help, or know of any businesses interested in sponsoring the event or making a donation, please have them contact Erin Perkins at eperkins@franklincityschools.com or (937)743-8611 ext. 1241. Thanks for supporting the Franklin Track & Field Program!